Numerous visitors told reporters about weeds, moss and water-filled gouges running through the northernmost part of Pattaya Beach. Tourists are complaining that all the money and effort Pattaya has expended to rebuild its beach is being wasted through neglected maintenance. 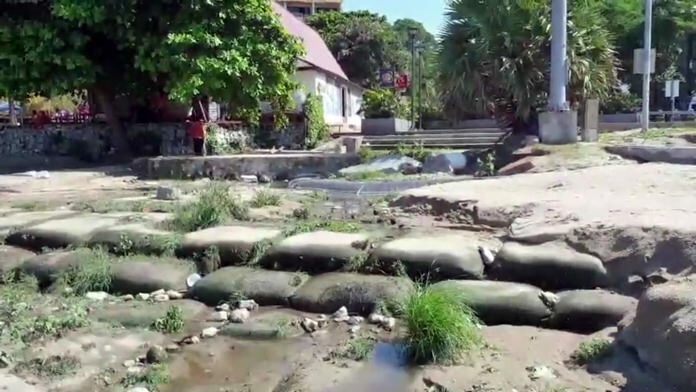 Numerous visitors told reporters about weeds, moss and water-filled gouges running through the northernmost part of the beach near the Dusit Thani Hotel. The low-lying beach suffers constant inundation from storm runoff flowing across Beach Road. The water has cut grooves in the newly replaced sand and wild grass and moss has grown there. In addition, tourists complained, there are uncollected bags of garbage also growing mold. Tourists pointed out that Pattaya has spent more than a half-billion baht to repair its beach, but won’t spend the relatively little money to keep it looking beautiful.